Southern Star A "Dixie Press" Publication Joseph Gilbert? Art. R. Sehnert) - The Co-Editors Harry Jenkins - Associate Ed. Fred Mischer) - Advisory Editors W.B. McQueen) Lee B. Eastman: Poetry Editor The Crew This Trip: Panurge Bob Tucker Phil Schumann Jack Speer Fred Fischer Paul H.Klingbiel D. George Fenton Art Sehnert Bob Tucker Fred Fischer Milton A. Rothman Harry Jenkins Panurge Morley THE LOG THIS TRIP FROM THE DUAL CONTROLS.........EDITORIAL.........The Editors....1 MUMBLINGS.........................DEPT............. Bob Tucker....3 Conversation on Mt. Everest.....Article.......Paul Klingbiel.... 7 HANDWRITING ON THE WALL..........DEPT.........Joseph Gilbert....9 Life Everlasting...............Article.......Fischer & Fenton...10 FROM THE STARPORT................DEPT. ...........Fred Fischer...15 P.P. Of Tim P. O'Nautisshann...Article...........Jack Speer...19 THE PASSENGER LIST ...............DEPT. ...........Art Sehnert...12 I Like Space Pirate Stories....Doggerel........Phil Schumann...23 THE MUNSEY PANORAMA............DEPT. ...............Panurge...25 FROM THE N. Y. COMMUN. OFFICE....News.................Morley...31 FROM THE PASSENGER LOUNGE........DEPT. ...........The Readers...34 COVERS BY SCHUMANN THE SOUTHERN STAR is published at approximately bi-monthly intervals at 1100 Bryan St., an address subject to change without by the Co-Editor. All advertisements, regularly contributed departments, subscriptions and letters should be sent to that address. 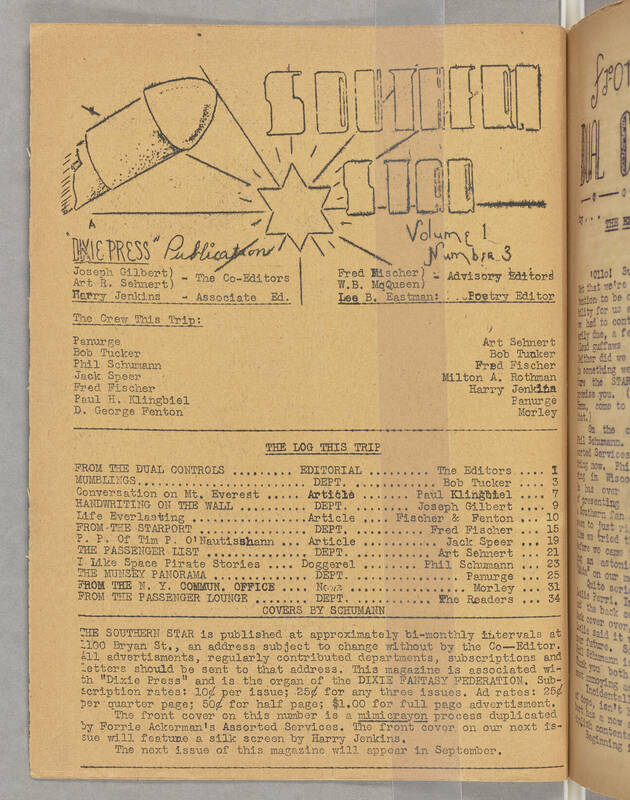 This magazine is associated with "Dixie Press" and is the organ of the DIXIE FANTASY FEDERATION. Subscription rates: 10[cents] per issue; 25[cents] for any three issues. Ad rates: 25[cents] per quarter page; 50[cents] for half page; $1.00 for full page advertisement. The front cover on this number is a mimicrayon process duplicated by Forrie Ackerman's Assorted Services. The front cover on our next issue will feature a silk screen by Harry Jenkins. The next issue of this magazine will appear in September.